We are a traditional choral society choir based in the North Yorkshire town of Richmond (the original with that name) There are usually about 60 of us in the choir and we sing a wide range of repertoire from Bach and Handel through to Will Todd, John Rutter and Bob Chilcott etc. 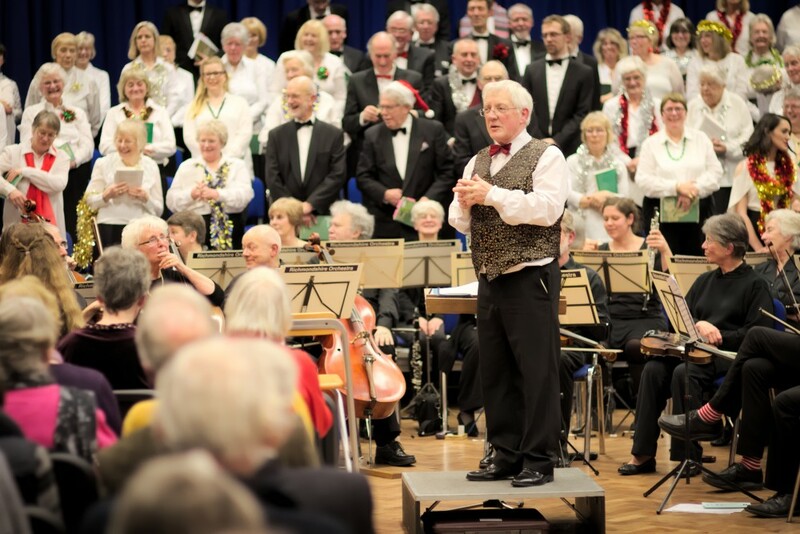 We usually give two concerts a year, one in December and the other in the Spring, which can be March, April or May depending upon when Easter falls, and when other local ensembles are performing. Our December concert will generally have a serious first set, often one long work, though the music will be chosen specifically to be appropriate for the Advent and Christmas season. We prefer to sing music written specifically for choirs to sing rather than make ours yet another 'jolly carol concert'. The Spring concert may be a major work, and in recent years we have sung Haydn's 'Creation' and Brahms' 'A German Requiem' (in English), or it could be several shorter works possibly with a loose theme. In May 2017 we sang Handel's 'Messiah', a four yearly treat. In April 2018 the programme is a Haydn Mass and four short but substantial works by Parry to commemorate the centenary of his death.